Interdimensional ramen, universe-wide zombie plagues, planetary wars about underwear, sentient plants—these are just a few examples of the kind of strangeness you’ll encounter in any given episode of Space Dandy. Space Dandy is directed by Shinichirō Watanabe, who’s best known for his directing work on none other than Cowboy Bebop and Samurai Champloo (another classic that’s on my docket to watch sometime soon). But while Watanabe’s stellar work is just as apparent in this series as it is in those he’s better known for, Space Dandy couldn’t be more different from those other works. Or . . . from just about anything, really. The series is a space opera following the titular character (who actually doesn’t seem to have any other name besides Space Dandy, or as he puts it, “The name’s Dandy. But you can call me Space Dandy, baby . . .”) on his bizarre romps throughout space in his ship, the Aloha Oe. Dandy spends most of his days tooling around the galaxy, trying (and mostly failing) to charm pretty ladies, and figuring out how to fund his random adventures while expending as little effort as possible. He’s joined by faithful companions QT, an AI robot who is plagued by outdated software and seems to primarily function as a vacuum cleaner, and Meow, a sarcastic, lazy alien who’s part of a race of cat-like beings from the planet Betelgeuse. The three make their living(ish) as alien hunters, roaming the universe looking for rare and undiscovered alien species, and hoping that each new find will be worth big bucks back at the registration center. Unfortunately for them, their skills at alien hunting don’t even come close to their enthusiasm for the job and they end up hopelessly bungling most of their hunts, with results that are often humorous and always bizarre. Throughout the series—and unbeknownst to the crew—Space Dandy is being pursued by Dr. Gel of the Gogol Empire, a mysterious alien who is gorilla-like in appearance, and whose motives are entirely unexplained. I’ve nearly finished watching the series, and it remains to be seen if any further context will be given regarding Dr. Gel (though at this point, I seriously doubt it). The most standout aspect of Space Dandy, from my perspective, is that every idea presented in the story is taken to the absolute furthest reach of its logical conclusion. For instance, Dandy detonates a powerful super weapon in the first episode, killing himself and his whole crew in the process—naturally they come back completely unharmed in the next episode, with no explanation given. Or there’s the episode where the crew of the Aloha Oe gets stuck in a time loop, only to be completely unaware of the fact until they’ve repeated the same day nearly 200 times. Or, in a particularly mind-bending episode, the gang catches a shape-shifting alien called a Chameleonian, who is so good at impersonating others that it makes the group start to wonder if their friends—or anyone they know—is really who they think they are, since anyone could be a Chameleonian. The series may explore a lot of the tropes and themes that other space operas have addressed, but instead of stopping at a believable point, it takes every idea it presents and runs as far with it as it possibly can. Another important feature of the series is its tendency to parody other anime and sci-fi series. 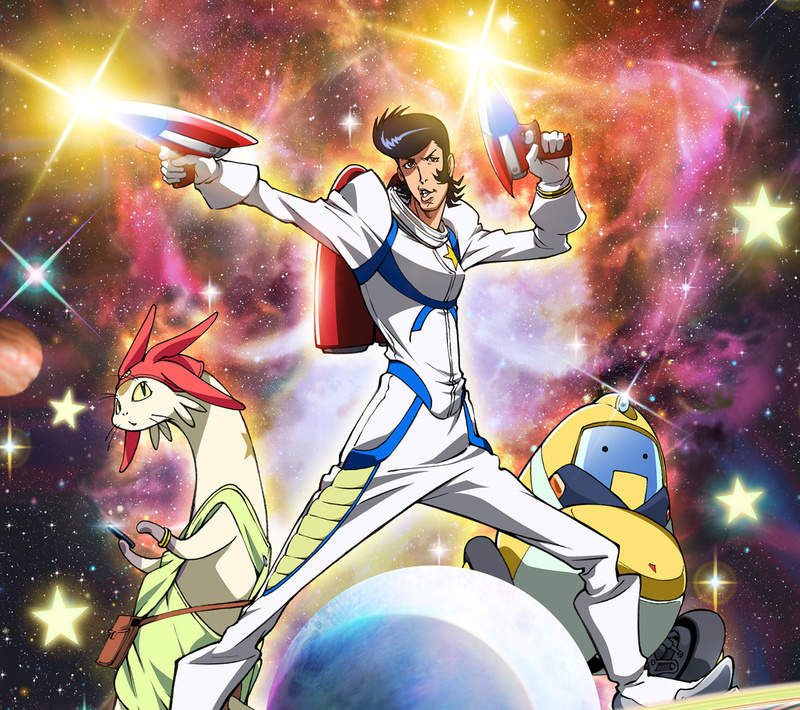 No trope or character archetype is safe—if it exists, Space Dandy will defamiliarize it to the point of ridiculousness. It’s the sort of parody that looks like a foolish, low form of humor on the surface, but the more you dig into it, the more you realize how smart it is. To me, that’s the true greatness of absurdist humor: if it can pinpoint some kind of truth or relatable feeling through the use of something so seemingly arbitrary and strange, it’s doing its job. With these two aspects in mind though, it’s important to note that to truly appreciate a show like Space Dandy, you’ll most likely need to have watched at least a few other anime series—the more, the better. This is not a series that an anime newbie will get a lot out of. Because it includes so much parody, a lot of the jokes will go over the head of a viewer who isn’t already familiar with the ideas that the series lampoons. Another characteristic of the series that may limit its appeal is the fact that it includes a lot of fan service. One of the main features of Dandy’s character is that he’s a total womanizer—or would be, if the objects of his affection gave him the time of day. The unsurprising and yet unfortunate side effect of this is that there are a lot of sexist overtones throughout the show, and it can get to be a bit much at times. It’s not so over-the-top that it turns me off to the series altogether, but . . . I’d be lying if I said it didn’t come very close to that point a time or two. Beyond these features, the sheer absurdity and strangeness of the series is apt to turn away viewers who otherwise haven’t seen much anime. If you know anime at all, you know it can get pretty nuts, and at least in my experience, it’s best to ease into it rather than diving into one of the weirder ones right off the bat. Context is key as far as this is concerned, and if you don’t already have a sense for the kind of goofiness you’ll often find in anime, it’ll just feel like the show is being weird for weird’s sake. That can work well sometimes, but a lot of people will find that it’s not their bag. It would be a shame to pass on all anime because it appears that the weirdest series out there are representative of the whole, and for that reason, Space Dandy is not a series to start without knowing what you’re getting into. Because I did know this beforehand, I’m finding this series to be a ton of fun to watch. I love the fact that nothing is too strange or far-fetched for Space Dandy to explore, and there’s something really satisfying about seeing an idea presented, having your expectations be built up toward a certain outcome, and then having those expectations turned totally upside down as the series goes boldly where no other would dare to go. It caters to that part of my brain that says “Sure, that makes sense. But what would happen if they did this [insert entirely improbable scenario here]?” It’s weirdly liberating to watch, and even though I find myself staring incredulously at the screen by the end of most episodes, I also get the sense that my brain has just been expanded in an entirely new, free-associative way. To what end, it’s hard to say, but it inspires creative trains of thought that I never would have found myself on otherwise, and it feels dangerous and uncomfortable and freeing, all at the same time. Space Dandy may not have a wide appeal for newer anime fans—likely to be incomprehensible at best and off-putting at worst—but those who are familiar with this storytelling style will find much to delight in when watching the series. In my case, I came for the low-stakes plot (or lack thereof) and utter goofiness, and stayed for the head trips and arresting storytelling devices. And if you’re anything like me, I bet you’ll enjoy this weird, wild ride too.